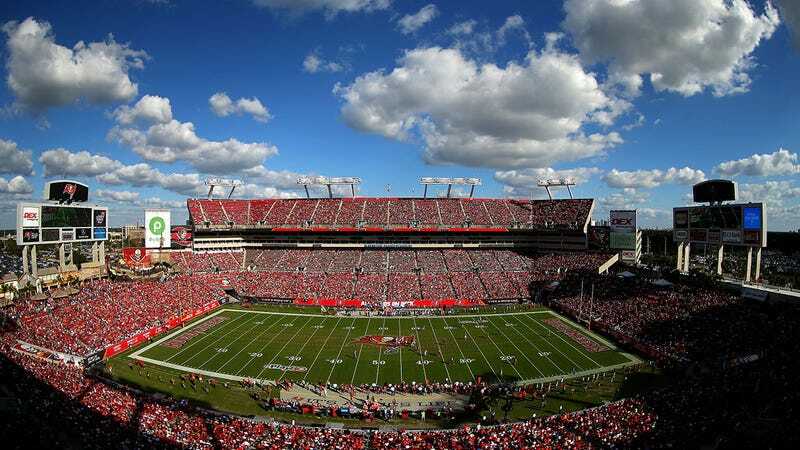 Sunday's revelation that the Tampa Bay Buccaneers are among several professional sports teams using unpaid, destitute "indentured servants" as concessions workers has led to swift action on behalf of government bodies as well as the Rays and their stadium services contractor Centerplate, but the Bucs and Raymond James Stadium concessions provider Aramark are refusing to talk about the allegations. The Tampa Bay Lightning informed the Tampa Bay Times that they ended their relationships with the New Beginnings "work therapy" charity in 2013 due to "reliability and consistency concerns." Those concerns didn't keep the team from recognizing New Beginnings CEO Tom Atchison as a "Community Hero" or from donating $50,000 to the organization, which is accused of forcing homeless residents to work concession stands in exchange for food and housing while confiscating the workers' Social Security checks. Of course, the sizzle here is that the local franchise of America's biggest sport is involved; they won't talk about the accusations, nor will Aramark or the NFL. Read the full Times update here, and our original recap from Sunday below.